National Geographic Society's School Publishing Unit Sold to Cengage Learning - Berkery, Noyes & Co., LLC. Berkery Noyes, a leading independent investment bank serving the education, information, and technology markets, announces that it represented the National Geographic Society (NGS) in conjunction with Tucker Capital Corporation, in the proposed sale of National Geographic School Publishing to Cengage Learning. With the planned acquisition, Cengage Learning will also obtain extended rights to use the National Geographic brand in the higher education and library markets worldwide. Since 2007, Cengage Learning and NGS have collaborated to produce English language learning materials for kindergarten through adult education in the global marketplace with great success. The newly expanded relationship will further leverage NGS’s world-class content — including images, video and articles — and Cengage Learning’s pedagogical expertise in the U.S. and global education market. The transaction is expected to close after the satisfaction of regulatory approvals and other customary closing conditions. Terms of the transaction were not disclosed. “National Geographic Society is an iconic organization which reaches over 400 million people annually through its vast content library and diverse set of media assets. This newly formed partnership with Cengage Learning will allow NGS to further enhance and expand its reach by leveraging Cengage Learning’s global educational platform. The combination of these two powerful brands will help accelerate their mission to solve the growing literacy challenges students and adults are facing throughout the world,” said Vivek C. Kamath, Managing Director of the Education Practice at Berkery Noyes. 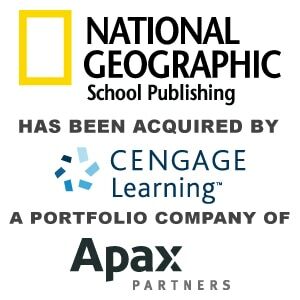 Cengage Learning will acquire National Geographic’s digital and print school publishing unit, which includes the National Geographic Science series, an innovative core elementary science curriculum, National Geographic Explorer! Magazines, and Hampton Brown’s literacy and language programs — resulting in the formation of a global literacy, English language learning and content publishing brand. “There is an unprecedented demand throughout the world for innovative learning products and solutions that address the challenges we face around literacy and ELL skills. NGS and Cengage Learning have been at the forefront of this issue and the combination of these two well respected organizations is a very positive outcome for the market ,” said Christopher Curran, Special Advisor to the Education Practice at Berkery Noyes. Berkery Noyes and Tucker Capital acted as co-financial advisors on behalf of National Geographic Society, initiated the transaction and represented it in its negotiations with Cengage Learning. Berkery Noyes provides strategic mergers and acquisitions transaction advisory services and financial consulting to middle-market education, information and technology companies in the United States and internationally. Berkery Noyes has been involved in many notable transactions in the media and information sectors, including the sale of Bookette Software to McGraw-Hill Education, the merger of Compass Knowledge Holdings with Embanet, Rockbridge Growth Equity’s acquisition of NorthCentral University, Interwrite Learning’s acquisition by eInstruction, Global Scholar’s acquisition of Excelsior Software, Macmillan’s acquisition of Hayden McNeil, and Leeds Equity’s acquisition of Ex Libris. For more information, visit: www.berkerynoyes.com. The National Geographic Society is one of the world’s largest nonprofit scientific and educational organizations. Founded in 1888 to “increase and diffuse geographic knowledge,” the Society works to inspire people to care about the planet. It reaches more than 400 million people worldwide annually through its official journal, National Geographic, and other magazines; National Geographic Channel; television documentaries; music; radio; films; books; DVDs; maps; school publishing programs; interactive media; and merchandise. For more information, visit nationalgeographic.com. Cengage Learning is a leading provider of innovative teaching, learning and research solutions for the academic, professional and library markets worldwide. The company’s products and services are designed to foster academic excellence and professional development, increase student engagement, improve learning outcomes and deliver authoritative information to people whenever and wherever they need it. For more information on Cengage Learning please visit www.cengage.com. Tucker Capital, headquartered in Princeton, New Jersey, provides informed financial counsel and investment banking services to middle-market education, publishing, media and direct marketing companies. From Fortune 500 companies focused on the publishing, catalog and e-tailing industries, to emerging growth companies and family-owned businesses, Tucker’s mission is to assist companies conceptualize and implement transforming financial and market strategies in today’s highly competitive business environment. Tucker Capital has worked as National Geographic’s exclusive advisor since 1995.For more information about Tucker Capital please visit www.tuckercapital.com.